Today, we're wishing Henri Farman-French aviation pioneer of the double-decker airplane-a very happy birthday! Born in 1874, Farman originally trained to be a painter but soon became interested in mechanics and sports. He bought his first plane in the early 1900s, set many flying records, and founded his own flying school in 1909. He soon built an aircraft manufacturing plant in partnership with his two brothers. Their F.60 Goliath was the first long-distance passenger airliner which began flying from Paris to London in 1919. The F.60 Goliath was originally designed as a heavy bomber, but the end of WWI meant that there would be no demand for the aircraft. Rather than abandon the project, the Farman brothers adapted the plane made of wood and fabric. They realized that the fuselage could be modified and converted to an airliner. With commercial aviation beginning to grow, there was a need for these aircraft. Changes meant that up to 14 passengers could be carried in the plane. They offered windows for passengers to enjoy the view and engines could be customized, though they were designed with two Salmson Z.9 engines. In January of 1919, the F.60 Goliath flew its first commercial flight with 12 passengers. The flight took 2.5 hours while the return flight took just over 2 hours. At the time, non-military flying wasn't permitted, so all passengers were uniformed, ex-military pilots with mission orders. With the success of this flight, other flights were made to spread the word of this new passenger plane. They even operated flights from Paris to Africa later that year in a nearly 17.5-hour flight. 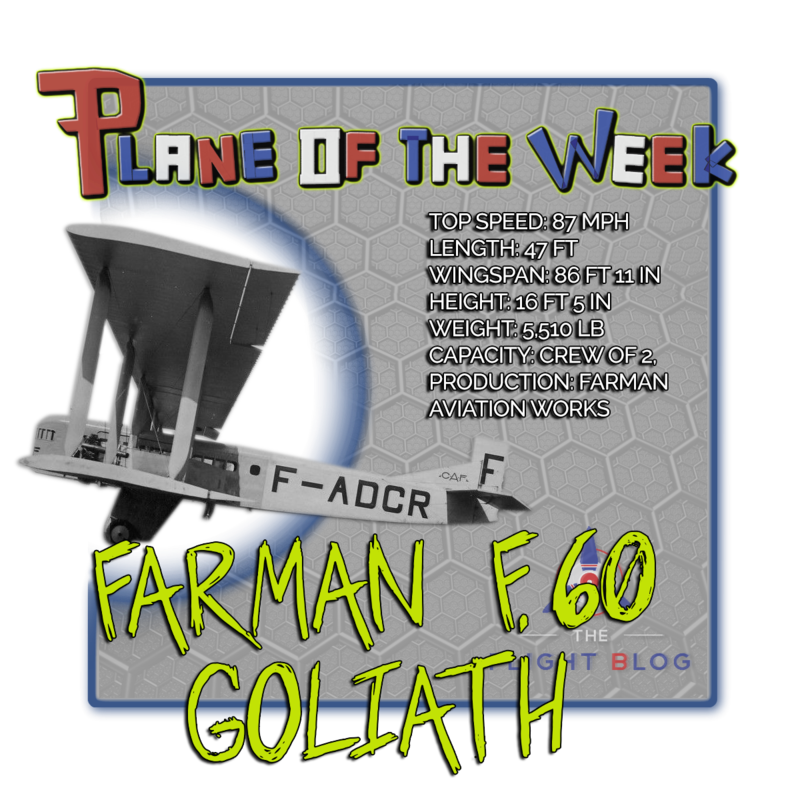 The F.60 Goliath, piloted by Henri Farman, set a record that year for the highest passenger flight at 6,200 meters with four passengers. Later that year, they broke another height record by reaching a height of 5,100 meters with 25 passengers. Airlines around Europe purchased F.60 Goliath planes with 60 being produced between 1919 and 1931. Unfortunately, no airframes survive today but you can view a forward fuselage at the Muse de l'Air et de l'Espace (Museam of Air and Space) in France.